Dog tricks are a great way to show off your dog's ability to your friends. However, before embarking on trying to teach your dog any trick, keep something in mind: every dog has its own personality, and try as you may, your dog may have absolutely no interest in some of the tricks you want it to perform. As well, some dogs are naturally better at some tricks than others. Build upon your dog's strengths. Each trick starts with an opening command and ends with a closing command - a release word like OK. The key to trick training is sequencing - breaking down each component of the trick so the dog can understand what is expected of him. Then put all the pieces together. Throughout the training process make sure to praise your dog. This will continue to help motivate your dog to work for you. Once the trick is complete, reward your dog with praise and hugs. Treats work well too, however, some handlers abstain from using treats in case the handler doesn't have any on hand when called upon to perform a trick with their dog. If you need to, use treats at the beginning of the training process. Once the dog is competent in the complete trick, slowly eliminate the treat so the dog gets used to accepting praise, not food, as the reward. A really good trick to start with is wag your tail. No matter the tail length, this can be done. All dogs do this already, especially when they are excited to see you. Use your dog's natural instinct, to wag when happy, to your advantage. The opening command is something like 'Are you a happy dog?' As soon as the tail wags, praise, release and reward. Put your dog in a sit. Put a treat to your dog's nose so he can smell it, but don't give it to him. Slowly, bit by bit, raise the treat up and back over the dog's head, while allowing the dog to continue smelling the treat. When the dog gets into the 'beg' position, say 'beg', then release and reward. Not all dogs are comfortable in this position, especially larger dogs. If this is the case, with the dog in a sit, stand behind him while supporting his back with your legs. Gently pull him into the position. Once there, say 'beg', then release and reward. Once he's comfortable with getting into the position this way, try using the above outlined method, but with you standing behind him, then move in front of your dog. In this trick, your dog will correctly pick the hand that has a treat in it. 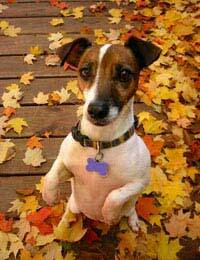 Put a treat in one hand - make sure your dog sees you do this. Make two fists and hold them in front of you and about 6" apart from each other. Then say - which one? Your dog will sniff each hand and try to nibble them to get at the treat. Don't open your hand. Eventually your dog will try to paw at your hand holding the treat. If your dog refuses to touch your hand with its paw, let him use his mouth to point out the hand with the treat. It will still wow your audience. First, only roll the dog on soft surfaces like carpet or grass. Some dogs naturally roll over, especially puppies. If this is the case, when the dog rolls over, say 'roll over', praise and reward. If your dog does not naturally roll over, start by putting your dog in the down position. Hold a treat in front of the dog's nose, and then slowly move the treat towards his torso and over the body, keeping the dog's nose close to the treat. The dog will eventually roll over to get at the treat. No matter the trick you are trying to teach your dog, be patient and do lots of repetitions. However, if the dog shows absolutely no interest in the trick, even with his favourite reward being dangled in front of him, move on to another trick.